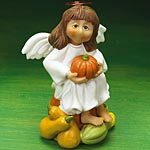 Angel Folk is the 3rd series in the "Folk" line of collectibles. Maureen loads her Sisters, Friars, and now Angels with a bit of sassy character and a ton of cheerful whimsey. They are approximately 3 to 4 inches tall by about 1.5 to 3.75 inches wide. Size varies with individual designs. Each resin reproduction is handpainted, following as closely as possible to the original FIMO polymer clay sculpture that was created by Maureen Carlson. The current licensee is Abbey Press from St. Meinrad, Indiana, USA.. The wings are resin and she wears a wire halo and is gift boxed with a title card.